Mad About Plaid makes a chic quillow that is stylish and functional! 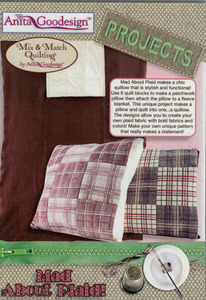 Use 9 quilt blocks to make a patchwork pillow then attach the pillow to a fleece blanket. This unique project makes a pillow and quilt into one...a quillow. The designs allow you to create your own plaid fabric with bold fabrics and colors! Make your own unique pattern that really makes a statement!